The Belgian bodybuilding company Bollekens was formed in 1923. It was a small family company owned the three brothers - Henry, Joseph and Francois Bollekens. 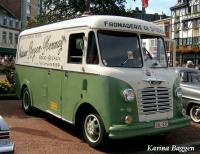 In the early 60s it began manufacturing truck cabs on AEC chassis, which were sold in Europe. In 1972, the owners have reached retirement age and decided to close the firm.